Old roses on an abandoned building. Old fashion roses have been around for hundreds of years but still hold a certain allure for rose lovers. While they have a reputation for being difficult, nothing could be further from the truth. 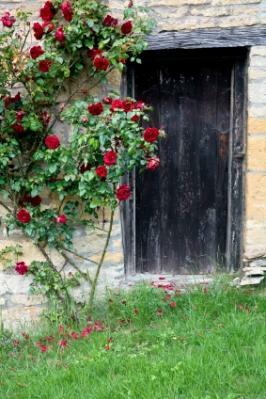 If you have ever walked around an old, abandoned homestead or farm, you have probably had the pleasure of discovering a few old varieties of roses climbing along a fence line or on a dilapidated building. These amazing flowers have withstood the ages and while the rest of the place seems overgrown and out of control, they seem to add a touch of civilization to the property. These climbing shrubs are very versatile and can be used as a hedge or as a touch of color on the side of a house or barn. Probably the most beautiful way to enjoy them is when they are mixed with other perennials for a splash of color in any type of landscape. A must for any English garden, these roses are usually found in pastel shades instead of the vibrant colors of the more modern, hybrid roses that are most commonly seen today. Surprisingly, these small, pale flowers are bursting with fragrance that will make your mouth water. Definitely, these roses are worth investigation if you are looking to add a bit of a wild, natural look to your yard. Also known as antique roses, the old varieties of roses have very simple needs and even seem to thrive on neglect, which seems evident by the abundance of them on abandoned properties where they bloom prolifically despite poor soil and little water. In addition to their easy care, older varieties of roses tend to get fewer diseases than their modern counterparts. This makes them ideal for a carefree garden. Basically, old fashion roses like to have from four to six hours of sun each day. They prefer to be in an area that gets adequate circulation to prevent mold growth and other possible health problems. Ideally, as with most plants, you should not over-crowd them. When planting old fashion roses, you should give them a rich, loamy soil that is well drained. Soil can be enriched with a mixture of compost and manure. Mix all of this together in a wheelbarrow and then put it all back into the hole and you will have very happy roses. Dig your hole about 14 to 18 inches deep and be sure it is wide enough for the roses' roots to sprawl out. If you live in a cold climate, the section of the rose between the root and the branches should be about one to two inches below the soil line. In warmer climates you'll want it to be about one to one and a half inches above the soil line. You really only need to water your old fashion roses about once a month. Give them a good, deep watering and then keep them mulched. Mulching will help the soil retain water as well as keeping the roots of your roses cool. It is also a great way to keep weeds at a minimum for less work in your garden and more time to relax and enjoy it.These old varieties of roses only bloom once a year. Once the blooms have faded you can lightly prune them if desired. Don't prune them too late in the year or you will drastically reduce the number of flowers for the following year. This is due to the fact that new blossoms form on growth from the past year. As a rule, they really don't need much pruning at all. However, if they seem to be growing over an area where you don't want them, you may need to prune a bit. You'll also want to prune away any damaged or diseased branches immediately. Some people skip this step, but your rose will appreciate a one to two inch layer of aged manure spread over the surface of their growing area each year in the spring. This will continue to enrich the soil much they way you did originally when you mixed the manure and compost into the soil to amend it during planting. You can also use a commercial rose fertilizer. Follow the directions on the package carefully. Do not assume that more is better. Jackson and Perkins has a nice variety of antique climbing roses. The Antique Rose Emporium specializes in old time roses with a huge selection that you'll love. Ashdown Roses has a lovely assortment of roses as well as books and videos that will teach you everything you need to know about these wonderful, living antiques.